hi, my name is India and i attend Queensland academy for Creative industries and i am studying design technology. our topic this term is on solar cookers, we must design and create a prototype for our assessment. It would be greatly appreciated if you could possible give me some information on this topic. Is there some specific materials you would recommend when designing a solar cooker? What type of people buy solar cookers? Who is an appropriate target market? If you could answer these fews questions for me that would be really appreciated. Hi, my name is Carmela and I am a design technology student at Queensland Academy for Creative Industries. Currently, I am researching and designing solar cookers. It would be very much appreciated if you could answer some questions for me and provide some expert appraisal. What do you believe is the most efficient design for the solar cooker? What is your opinion on getting everyone to start cooking with solar cookers? What may be the challenges that come with this? What do you believe would be the best materials to use for a solar cooker? For example, mirrors or aluminum foil as reflectors, acrylic or glass for the window, etc. Thank you for this great inquiry about solar cooking and solar cooker design and application. You ask some complex questions about solar cookers. I would have to start off by saying though that, in my opinion, there is really not one perfect design when it comes to an “all around” or optimal design for a solar cooker. Each solar cooker type, of the three main styles, is unique and has its own attributes and advantages. An optimal design I would say is one that can be easily used with little effort and attention by the user, is easily portable and storable, and is durable enough to last through many years of frequent use. Is there such a solar cooker in existence today, readily available to the consumer? I don’t believe there is…at least not yet. But, there are many solar cookers available to purchase that do come somewhat close to being that “optimal design”, yet still they come up short overall. Carmela, you ask which I believe to be the most efficient design. I would say that the parabolic cooker is the quickest when it comes to the amount of time required for heating and cooking. It concentrates the sun’s rays to a very tight and intensely hot focal point. Because the focal point is so tight, this type of cooker requires more frequent adjustments. A parabolic cooker of ideal proportions (usually no larger than and no smaller than 5 feet (1.5 M) in diameter can cook as fast as an electric and gas stove top burner can. It can boil a gallon (4 liters) of water in about 15 minutes on an ideal, sunny day. An egg can be fried in two minutes. Of course with a parabolic cooker the required adjustment, or focusing, (tracking) is more frequent than is necessary when using one of the other styles of solar cookers. A parabolic cooker is efficient in the sense that you can cook most foods on it in a very short period of time, comparable to electric and gas stoves/ovens. Now, a box style solar cooker (oven) can be used in a manner that does not require as much attention or focusing (tracking) due to its design towards greater heat retention through a cover (lid) and the insulation of the oven. 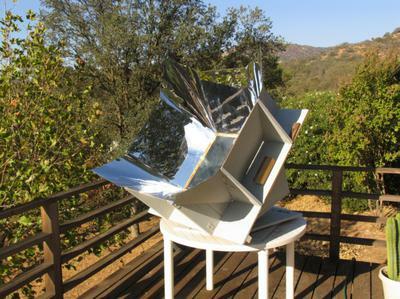 Also, with a solar box cooker, there are no tightly concentrated focal points; rather the sun’s rays are more broadly concentrated by the reflector panels into the oven interior, by passing through the transparent lid or cover of the oven where they are converted to heat energy and absorbed by the dark colored oven interior and the dark colored cookware. Heat retention is the key to a box style and panel style solar cooker. If your solar cooker loses heat faster than it can accumulate and retain it, then you will not have the desired results because the temperatures will not remain at levels sufficiently high enough to cook effectively. On an a day with ideal sunshine and conditions, one can cook many foods in a solar oven without having to attend to or make adjustments for as many as three to five hours at a time. 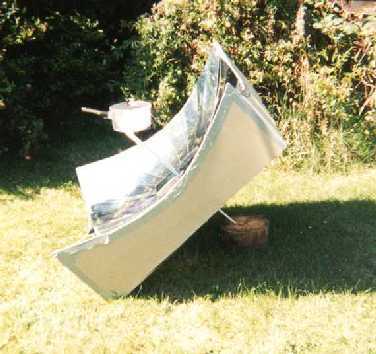 A solar box style cooker could be considered efficient in the sense that it does not require one to attend to it as constantly as a parabolic cooker. Both the parabolic and the box (oven) style cooker can be very efficient cookers if designed and built properly. I could go on for a great length of time highlighting the differences and the advantages and disadvantages of each style of solar cooker, but it would take pages of writing to do so. I invite you to browse the many pages about solar cooking and solar cookers on our website as well as the videos and customer/visitor contributions and comments on our site; and I believe that you will gain a better understanding of solar cooking and it’s scientific as well as practical principles and applications. And, even better yet, I would suggest experimenting with solar cooking and solar cooker design, since there is no better way to know about these things than by actually seeing the results and outcomes. Now some brief answers to your other questions. As for materials for building a solar cooker, the best of course can be expensive, but you can do well with things that are commonly found within a hardware or home improvement store such as Homedepot etc. For reflector panels you can use aluminum foil, but it will wear out and turn “foggy” in a short time. Adhesive backed Silver Reflective Vinyl (polyester) can work well and is durable enough to last several years and still retain its reflectivity. Reflective Mylar is very similar, but would require an adhesive (glue) and a colored backing or substrate in order to adhere it to your panels. Silver Reflective tape is similar and can give good results. Polished Anodized Aluminum is lightweight, very durable and retains a high reflectance rate, but it is one of the most expensive materials to use. Glass mirrors work well, but they are heavy, can break easily and are difficult to cut and form to the shapes and dimensions you might need. All of these materials will serve for the reflector panels on a box, panel, and parabolic cooker. Box style cookers need to have an inner and outer box (shell). The inner box will be your oven interior and the outer box will be the protective and forming shell. The inner box should not be able to melt or off-gas, so it is preferable to use metal, aluminum, tin etc. In between the two boxes will be a space that needs to be well insulated to prevent heat loss. The insulation should not emit gases, decompose nor degrade with exposure to moisture and heat. Food grade and “natural” insulations are best for this. Simple insulations can be items such as cardboard, newspaper, wool, cotton, wood etc. etc. The interior of the box cooker (oven) can be dark in color in order to absorb more heat and this can be accomplished by using a paint that won’t release toxins or gas when heated. High temperature Barbecue Paint can be used, but it does need to be “cured” or cooked off in the sun for several days to eliminate the smell. Dark, thin, metal, covered pots and pans are the ideal cookware for use in a solar oven or panel style cooker. Most preferable for a solar oven would be to use a glass lid or cover, and it would need to be tempered or heat resistant so that it does not end up shattering after a few uses from exposure to high temperatures. If you cannot find such a glass cover then you might well find one at a glass shop where they can custom manufacture it for you. Sometimes it can be found at a reasonable cost. If this is not an option then Lexan is a heat resistant type of acrylic cover that works well. You both asked what people use solar cookers and how can we get more people to use solar cookers for their everyday cooking needs. There are many who use solar cookers, those who desperately need a means to cook, such as in third world countries, and those who do it more for fun and for practical and preparedness purposes. We sell solar cookers to people who are concerned about the environment and our limited natural and energy resources and to the many who want them for emergency and survival situations, to those who are outdoor enthusiasts and to those who live in such a manner that it is their principal means of every day cooking of their food. We would love it if everyone had a solar cooker and would use it as often as possible, because we feel that this would make a major impact on the way we live our lives and the way we treat and consume our natural resources, not to mention the personal savings that people could realize in their personal economic situations. And, let’s say if the power were to go out for an extended period of time, due to natural or manmade occurrences we would all be able to endure more easily the consequences of such an event. These are just some of my thoughts and ideas in response to your questions. Of course you can find much more in depth information on the same within our website and from contributions from our website visitors.